[UPDATE Dec 17: Election Results] A big win for the OBA sees Dame Jennifer Smith [PLP] ousted from her seat by Kenneth Bascome [OBA] in St. George’s North. This was the third time they matched up, with Dame Jennifer winning by 25 votes in 2007, and 8 votes in 2003. The OBA pick up one seat and the Dame is gone. Cornell Fubler [IND] also contested the seat. 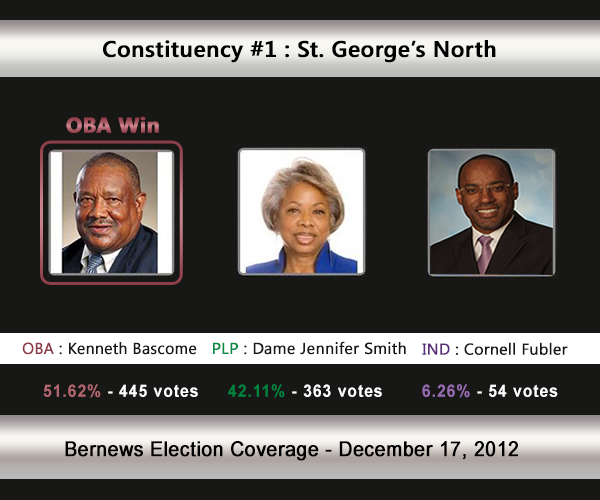 Kenneth Bascome [OBA] and Dame Jennifer Smith [PLP] will match up for the third time in St. George’s North. The polling station is East End Primary, 6 Grenadier Lane, St. Georges. Dame Jennifer has held the seat since the 1993 General Election, and retained in the two previous elections by close margins. In the 2007 General Election, she received 25 votes more than Mr Bascome [474-449] who was representing the UBP. In the 2003 General Election, Dame Jennifer defeated Mr Bascome by 8 votes. 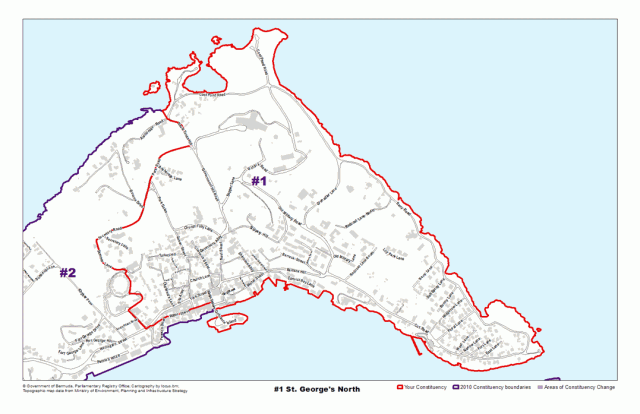 Areas St. George’s North compromises of, or is located by, include Secretary Road, Park Road, Naval Tanks Hill, Kings Square, Water Street, York Street, Rose Hill Street, Somner Lane and islands including Ordnance Island, Gun Powder Island, Hen Island, Horseshoe Island, Peggy’s Island, and Higgs Island. Dame Jennifer Smith has served the people of Bermuda with distinction over many years with thirty-one years of service as an outstanding Parliamentarian. She led the Progressive Labour Party to two general election victories on November 9,1998 and July 24, 2003. Her service to Bermuda and its people was recognised in the June 2005 Queen’s Birthday Honours when she was made a Dame Commander of the British Empire (DBE). When she made her debut as a candidate in 1972 (four years after universal adult suffrage was implemented), she became the youngest Bermudian woman ever to run in a general election. In December of 1980, she was appointed a member of the Upper House, the Senate, where she served for nine years before winning a seat in the Lower House, the House of Assembly. Over the years, she changed the constituency of St. George’s North where she contested the seat, from a United Bermuda Party (UBP) stronghold to a Progressive Labour Party (PLP) stronghold. Under her premiership,the PLP’s long established goal of single seat constituencies was finally realised. It is ironic that the boundary changes which resulted, changed her constituency to a marginal district. Her extensive and wide ranging community service covers the entire spectrum of Bermudian life including service clubs, professional and international organizations, the arts, culture, medicine, and women’s issues. Elected as Deputy Speaker in 2003, Dame Jennifer served as Chair of: the House and Grounds Committee, the Private Bills Committee and the Committee of Chairman. In addition, she served as Chair of: the Bermuda Parole Board, the Stamp Design Advisory Board, the Historic Wrecks Advisory Board and Government Employees Health Insurance (GEHI) scheme. On 1 November 2010, she was reappointed to the Cabinet as Minister of Education. She was educated at The Berkeley Institute and the Art Institute of Pittsburgh, Pittsburgh, USA. She has been awarded three honorary doctorates: from her alma mater The Art Institute of Pittsburgh, from Morris Brown College, USA; and Mount Saint Vincent University, Canada. She has also been the recipient of many awards, including the “Woman of Great Esteem” award from Q-Kingdom Ministries New York, USA; and an award from the National Congress of Black Women, Inc. Washington, D.C. USA. She is a member of the Richard Allen A.M.E. Church. Kenny Bascome was born and raised in St George’s. Educated at East End Primary, Howard Academy and St George’s Secondary, he has dedicated a large part of his life to two causes – helping at-risk youth and fighting for the community of St George’s. Today, Kenny is the Mayor of St George’s, a role into which he pours much of his time and energy. After serving the Corporation of St George’s for 15 years as a Common Councillor, then an Alderman, he was elected Mayor in 2009, and again in 2012. Many experiences shaped him into the leader he is today. But some stand out. He coached the soccer clubs in St David’s and St George’s for many years. He operated the concession at Tobacco Bay with his wife of 27 years, Rochelle. He spent countless hours mentoring young men in prison. He was a volunteer at Windreach Recreational Village.